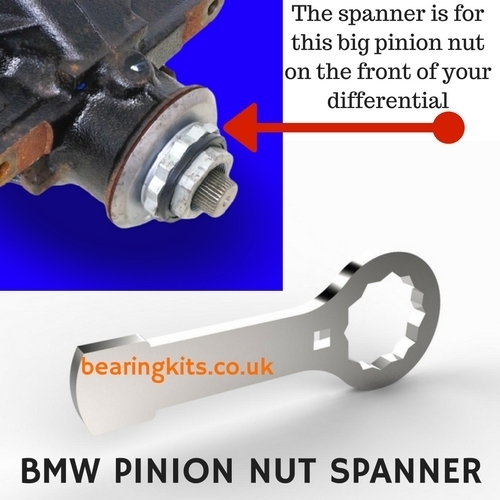 This is the tool needed to remove and replace the pinion bearing nut on the newer style of BMW differentials. Removing the nut on your diff is not a big problem without this tool, some people just use a hammer & chisel ! But correct tightening must be done in order to set the pinion bearing preload. This is when the correct size tool is essential. If the bearing preload is not correct on your diff the bearings will fail prematurely. This tool is only required for the later style BMW diffs with the slide on propshaft joint that is secured with the large flat sided nut. Please Note: The tool is steel colour and not chrome plated like the picture shows.